Good news for the cheap photographers, Yahoo! wants back in the photography sharing game. Flickr has redesigned their website and is now offering 1TB of Free photo storage to anyone. 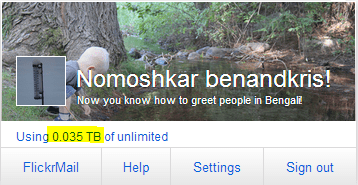 You can see on my grandfathered Pro account I have only used 0.035TB up in 2 years! To give you an idea of how many photos you can store…. Android Phone Camera (8 megapixel) = 400,000 photos. Canon EOS Rebel T3 (12 megapixel) = 300,000 photos. Nikon D3100 (14.2 megapixel) = 245,000 photos. Canon EOS Rebel T3i (18 megapixel) = 200,000 photos. (Obviously if you’re shooting in RAW you won’t be getting that many pictures). Tip: Grab an Eye-Fi card ($28 on Amazon) to automatically upload pictures when your camera is near your Wireless router. On your Android phone use Flickr Uploader to automatically upload pictures as you take them (you can set it to only upload when you’re on Wi-Fi).